Confederate Gen. John Bell Hood awoke on the morning of November 30, 1864, “as wrathy as a rattlesnake.” The entire Confederate Command structure had failed. After a brilliant march led by Forrest, Cheatham, and Hood, among others, which got behind Maj. Gen. John Schofield’s XXIII and IV Corps and threatened to capture the lot, the sack was not cinched and Schofield had escaped. Now with bridges out over the Harpeth River, Hood had another chance at Franklin. As wagons were being slowly crossed, Federal infantry filled substantial trenches and earthworks awaiting the call to cross the river and escape to Nashville. At 4 p.m., Hood ordered his men forward. In the fading light, nearly 15,000 Confederates charged to Federal works. The fighting went well into the night, and at points the Confederates’ aggressiveness seemed to have paid off. But eventually, they were bloodily beaten back while the Federal army escaped. In the recriminations that followed, people have said Hood failed and should have used Forrest to cut off the retreat. Two weeks later, Hood’s command suffered a devastating defeat at Nashville that drove him back to Tupelo, Mississippi, where he resigned his command. Franklin is a preservation success story–a terrible field recovered from the encroachments of modern growth in the shadow of Nashville. This is a heart-rending story that everyone interested in the Civil War should hear. William Lee White is a Park Ranger at the Chickamauga and Chattanooga National Military Park, where he gives tours and other programs at the Chickamauga and Lookout Mountain Battlefields. 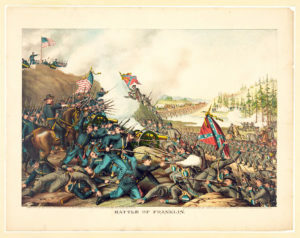 He is the author of Bushwhacking on a Grand Scale: The Battle of Chickamauga, and Let Us Die Like Men: The Battle of Franklin, November 30, 1864 (part of the “Emerging Civil War” series published by Savas Beatie LLC). He has also authored several articles and essays on topics related to the Western Theater, notably the edited diary fragment of Maj. Gen. Patrick R. Cleburne in the Tennessee Campaign of 1864, part of the “Campaigns of the Heartland” series edited by Dr. Stephen Woodworth. He is the editor of Great Things Are Expected of Us: The Letters of Colonel C. Irvine Walker, 10th South Carolina Infantry CSA. Over the years, he has spoken to many roundtables, historical societies, and other history-minded groups.